Which States are the Most Vegan? And, Which States aren’t (but really want to be)? This is the golden age for being a foodie like me. Not only can you find every cuisine but also restaurant concepts catering to the dietary restrictions of SoCal’s residents, whether needed or imagined. Something I hear often from people that move to California from elsewhere is that California has more restaurants than anywhere else that aid in dietary needs for those allergic to dairy, gluten, and more. One of the biggest dietary needs emerging is the Vegan craze, which means the food does not contain and is not made with any animal products. More and more are showing interest in eating at vegan restaurants, as you can see below. 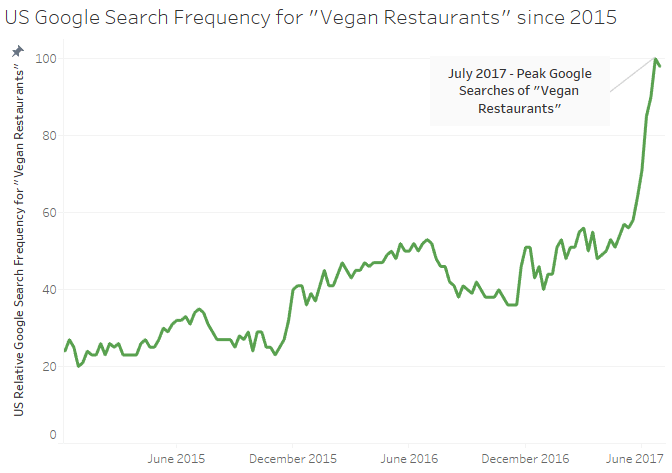 When looking at Google Trends to study the search frequency of the term “Vegan Restaurants” over the last five years, the term has enjoyed a general incline in interest but has absolutely skyrocketed in the last few weeks. It’s a safe assumption that not every state in our great country embodies an equal enthusiasm for this new trend. Let’s see which states’ inhabitants are the most interested (which will be represented by the red diamonds in the following graphic). And the state with the most Google Search interest in Vegan Restaurants is…. I’ll admit I’m a bit of a homer for California and our acceptance of all people with all types of diet preferences, but still, this is a shocker. Sure, California ranking 3rd behind Oregon makes sense to a degree, the nature-loving Portlandians (Portlanders?) could arguably have more vegan interest than the LA fad diet Los Angelenos, but it’s dumbfounding that Nevada, the home of Sin City, takes the cake. I mean, I don’t think I’ve ever overheard someone drunkenly stumbling down the Las Vegas strip searching for a beet salad and taro chips. 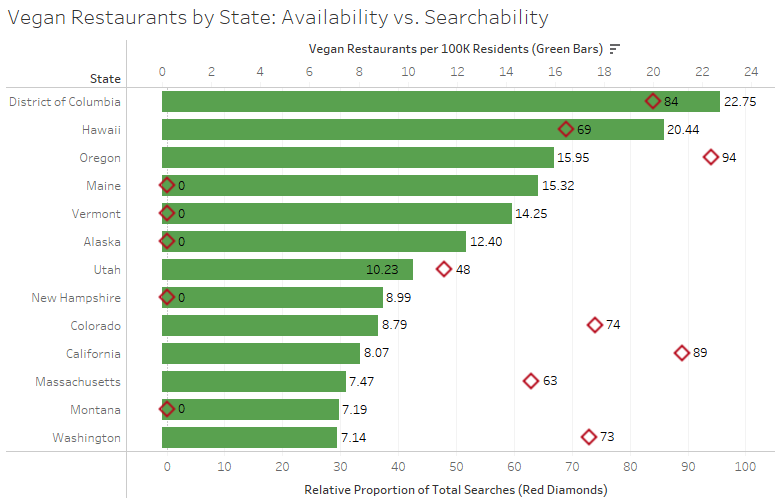 As seen in the chart above, the red diamonds indicate the relative proportion of Google searches, and are overlaid with the green bars, which mark the actual frequency of vegan restaurants per capita (metric is the number of vegan restaurants per 100,000 state residents). While Nevada has the most Search Interest, it has far from the most actual vegan restaurants, with only 6.77 vegan restaurants per 100K residents. While this places Nevada well behind other leaders such as Washington DC (22.75 vegan restaurants per 100K residents) and Oregon (15.95 per 100K residents), and even Hawaii (20.44 vegan restaurants per 100K residents), which had a relative search frequency of only 69. It’s beaten by states well outside of the top 10 in searches such as Hawaii and Massachusetts. When looking at the same visual, but ranked by actual restaurant frequency, there are some more interesting insights. 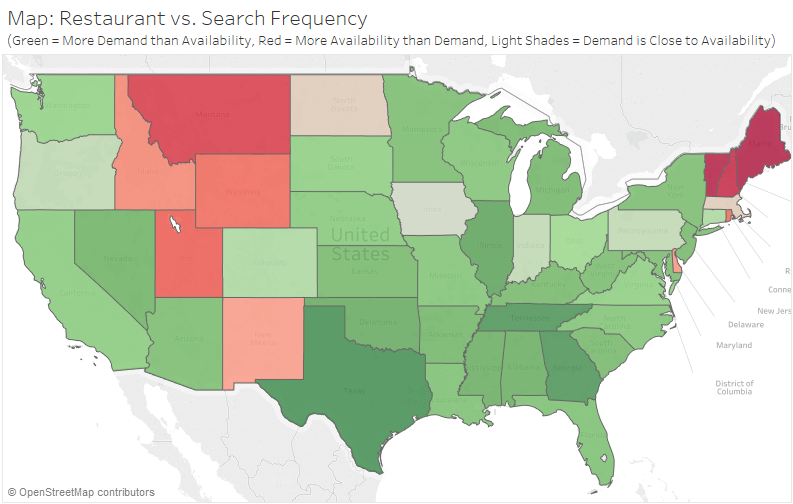 While the top 3 (DC, Hawaii, and Oregon) all have relatively high search frequencies as well, Maine, Vermont, and Alaska (which have the 4th, 5th, and 6th highest ranking states, respectively) have such low Google Searches for “Vegetarian Restaurants” that their proportion of total searches was zero. Turns out I was dead wrong about California being the Mecca of Vegan food, as the Golden State only manages the 10th highest rank of vegan restaurants per capita. 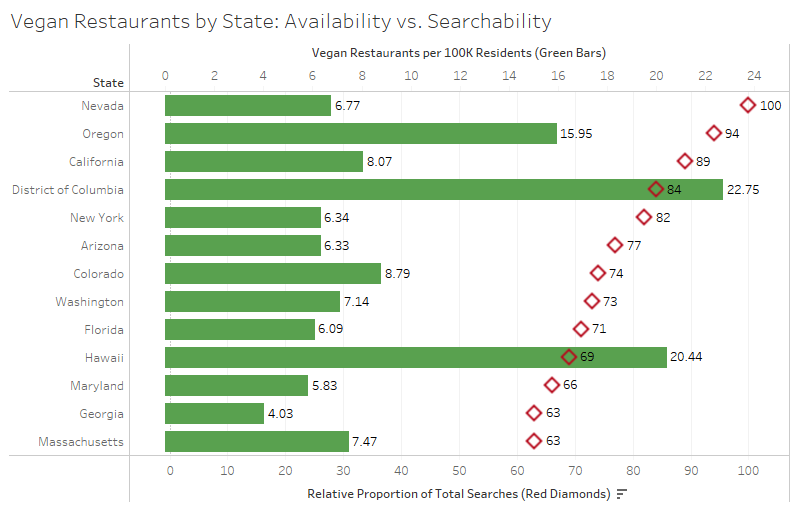 The above graphic compares each state’s relative demand (state ranking in the proportion of Google searches) vs. actual vegan restaurant availability (state ranking in the number of vegan restaurants per 100K residents). States in dark red are relatively over-populated with vegan restaurants, in comparison to their Google search frequency. Northern states in the non-coastal west (Montana, Wyoming, etc.) and the north east (Maine, Vermont, and New Hampshire) all fall in the category of having more vegan restaurants than their residents show an online interest for. States in dark green are relatively underpopulated with vegan restaurants, and have a much higher proportional amount of Google searches directed to “Vegan Restaurants.” Some surprising states in this list, such as Texas, Tennessee, and Alabama happen to be members of the Barbecue Belt (a term I literally just made up). States in lighter shades, such as Pennsylvania, Oregon, and whatever that state is to the southern border of Minnesota (just kidding, Iowa…yeah, I’m pretty sure that’s Iowa), all have a close-to-matching amount of online interest with the actual physical representation of vegan restaurants. Thank you for reading my latest data post. As a product marketing and data analytics professional, I have a passion for data-backed storytelling. These posts are my way of integrating real data with my personal diverse interests, which include anything from travel and entertainment to economic and societal issues. If you have any comments, story ideas, or prospective data projects, please feel free to email me at dwpwriting <at> gmail <dot> com or contact me on LinkedIn.